First of all, I am glad that the whole idea of taking a diet-break mid-prep, is no longer a novel idea. It’s much easier to propose the idea of tackling a contest prep diet with pit stops along the way. If you have ever prepped, you know how it is. We always feel a little bit behind no matter how well we are doing, and even athletes who are a bit ahead of schedule have a hard time sleeping at night. 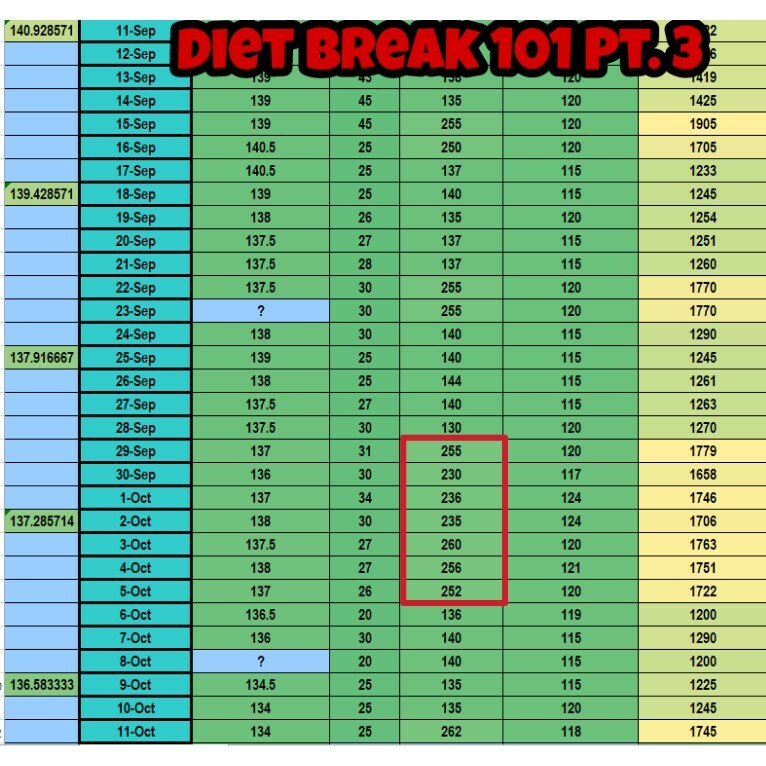 In reality a diet-break/diet-deload shares a similar purpose to that of a refeed within the week. I can only imagine the reaction in this day and age from handing over a contest prep plan to an athlete without weekly refeeds. It’s almost expected on their end because it’s in most places considered to be “best practice.” The same can be said about the diet-break, and what I wanted to do is take the time to share with you three different case studies where stepping off the gas for a minute allowed us to go further afterwards. The columns in this sheet are in the following order from left to right: weekly average weight and change in weight, date, daily weight, fat, carbs, protein, calories, and training schedule. When you look at these pictures of Kelsea Koenreich, words like “grind”, “pain”, and “sacrifice” probably come to mind. If you are familiar with her, you know this to be true. However, the hammer isn’t always the best tool for the job. During her last prep we hit a plateau at about 11 weeks out and with 10lbs to go. In bodybuilding lingo this is not ahead of schedule and certainly not close enough to give you happy feet. Intuitively, a bodybuilder wants to grind away in this situation, but in this case, we kept our poise and took a diet break. We took a hiatus from a deficit for a full 7 days and almost right after we finished the break, we started to progress again. Knowing when to push and when to back off is crucial. Some of you know how Kelsea is known for her fearless grind, so this time she had to practice easing off the gas pedal, which something that is even harder to do for athletes with this type of spirit. I can with great confidence say that this final “diet-deload” played a vital role in the final look you see above. It makes sense…to take intermittent breaks from fat loss for a number of reasons. Above is an example of my first plateau with my client last year. The only adjustment we made is that we took a diet break, the rest is self-explanatory. The column on the right highlights the time spent at maintenance (rise in carbs) calories. 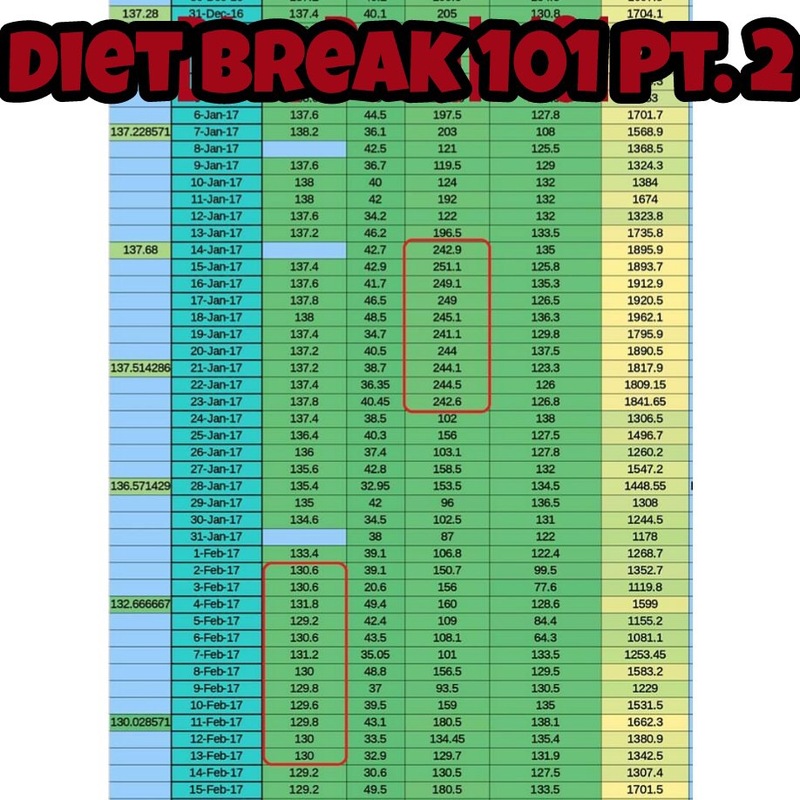 The column on the left shows the weight trend the days after the diet break was completed. In this case it really helped get rid of water retention that was masking the progress we were actually making. It was to the point that I could not pick it up in the pictures she was sending in, and usually I am very good deciphering water retention. So, we know that taking formal fat loss deloads can allow for more progress over the long term. These periods may help you across the board with other aspects of dieting as well, but the big one to me is that they have the potential to make fat loss healthier. Particularly for women who really get the short end of the stick when it comes to fat loss. Often overlooked is the potential negative side effects fat loss can have on a woman’s health. This is particularly true when it comes to reproductive health and amenorrhea. While it might be something that is unavoidable at a certain point of a fat loss phase, it’s something that if we can delay, it makes for better fat loss for a longer period. When amenorrhea takes place, it may potentially make further fat loss more difficult. However, what I want to focus on here are the more important health implications that come along with it. More research is coming to light in regard to amenorrhea being more heavily related to energy availability, and not as much correlated to low levels of body. This means that, through strategic refeed periods, we can minimize the time spent in a potentially unsafe environment. In the above case study my client had missed her period a few days prior. Even though fat loss was going well, we threw in an emergency diet break in order to try to regain hormonal balance. It worked like a charm, and everything started working again in proper order. We went on to lose another 10lbs while keeping our hormonal health intact. 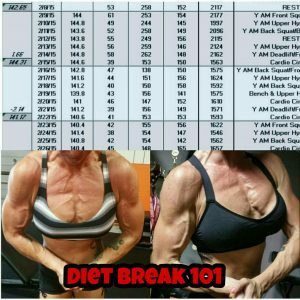 She achieved her best physique to date at the end of the prep, but most importantly we found a healthier way to pursue the sport. This aspect alone is reason enough for me to keep diet breaks in as a standard approach with how I prep my athletes. In some cases, I might even have women deep into a prep taking full on diet breaks on a monthly basis in an effort to keep things healthy. 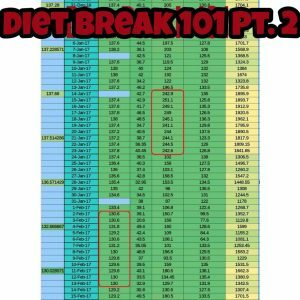 So, there you have it folks, three different diet break case studies, and if this entry gets a good response I will dig up more for you guys. 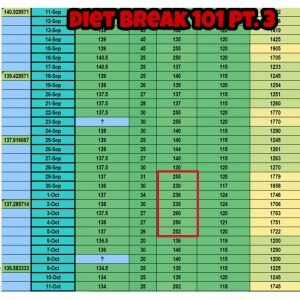 Food for thought (literally) next time you are designing your next contest prep diet, or perhaps when you find yourself in the middle of an intense fat loss plateau. So interesting. 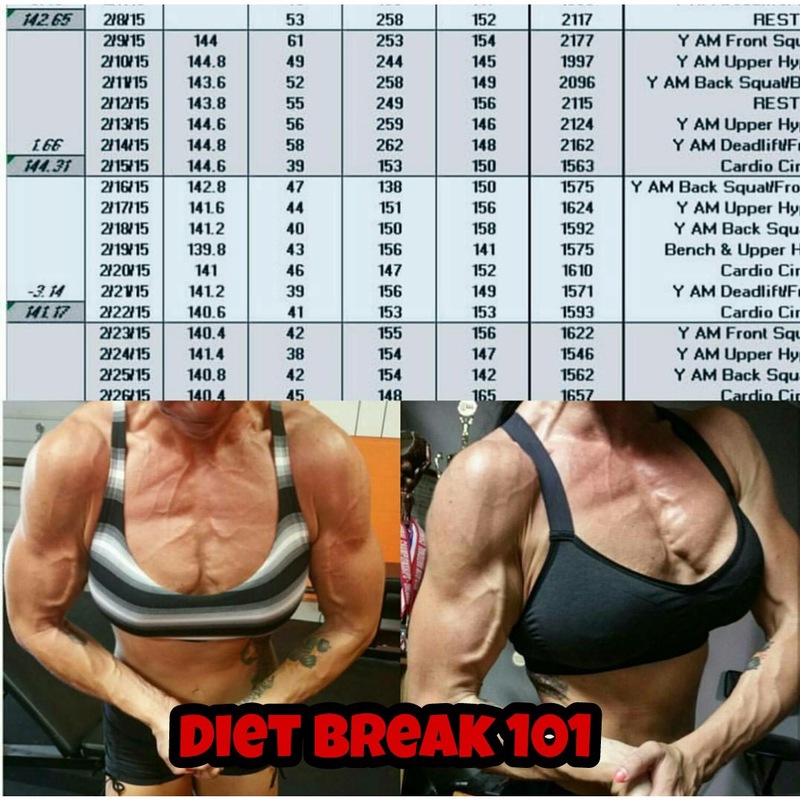 I just listened to Mike Israetel on Revive S. YT suggest that the only meaningful, physiological “reset” you can make during a cut is through a diet break. Weekly refeeds, cheats simply don’t offer anything beyond a mental perk and (possibly, imo) a well timed spike for a single WO if your lucky, while absolutely risking a step back (multiple steps back in the aggregate) without any real utility. I’m definitely going to forego refeeds and cheats and see if, when it stalls and gets ugly, how a diet break affects the remainder of the cut. A couple of items of note: I see, for your client, the day after the diet break, you dropped cals even lower then before the break. That was one of my Q’s (how to handle that first week back). Also, what happened Oct 11th? I see a spike. Thank you.